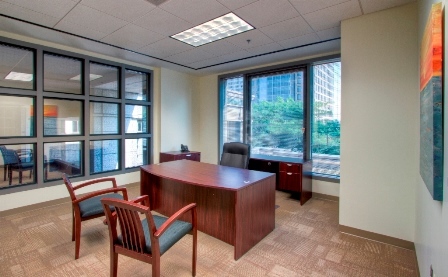 Executive Suites companies in Atlanta such as Peachtree Offices may offer better value, more stability and greater flexibility than subleasing office space for some companies. Typically, an executive suite can be a great value for those needing less than 1000sq.ft. of space and those that see the value in the amenities an executive suite provider can provide. There is a perception that subleasing office space may be less expensive than executive Suites. A sublease means you are leasing from a tenant of the building and not the building. The reality is that while the initial price of a sublease may seem low, the real costs of sublet space may include broker fees, security deposits, costs of technical support staff, janitorial service, equipment and utility charges. These costs often make subleasing an unpredictably large expenditure. With an executive suite such as Peachtree Offices, pricing is all inclusive and their receptionists could potentially save you money on staffing. People believe subleasing office space that’s furnished and/or technically well-equipped saves time and money. The truth is inheriting the previous tenant’s furniture and equipment may seem like a convenience and savings, but pre-existing problems, technical incompatibility, service issues and the lack of support staff are equally an expense and a headache. There is a common misconception that office leases are long term agreements. However, Peachtree Offices offers solutions to fit your needs. From 1 month to 24 months terms and if you need more space half way through your agreement, they would love to help you with that as well. There are many benefits in taking space in an executive suite including flexibility, low upfront costs, on-site management and short terms. The reality is that in most cases, landlords may have the right to revoke a subleases at any time. For example, if another tenant requires additional space in order to renew their lease, the landlord can remove any sublease tenants with very little warning. If you sublease space and the original tenant defaults on their lease, you could lose your security deposit and/or be forced to find new space. If the original tenant goes out of business, the landlord can seize all the property within the space. In this case, you may have a limited amount of time to vacate the premises. In comparison, with an executive suite provider like Peachtree Offices, you have straightforward pricing that can be trusted. Not to mention the value added commitment, flexibility, and local on site management and staff. Lastly, with features such as access to high end conference rooms, receptionists, ready to go phone system and free high speed internet, the overall cost may come out lower for you when compared to a sublease. This can be particulary true when you consider the expense associated with making a space asthetically pleasing. For intance, Peachtree Offices decorates common areas with high end furniture and abstract paintings from Atlanta abstract artist Julie Gudger. These finishing touches make a first class impression for businesses which can be priceless if it helps grow your business. At the Peachtree Offices Alpharetta location they also provide spec suites which are very similar to executive suites only larger. An executive suite can provide fully furnished, staffed and equipped office space that can accommodate a small or large work group. This temporary office space or conference room can be fully operational immediately. To find out if a sublease or an executive suite is the right choice for you in Metro Atlanta, contact us or fill out the find your office now form.